A young girl can learn a lot during 10 years of participation in the Girl Scouts; however putting what she has learned into practice takes hard work and determination. Possessing these characteristics, along with having many accomplishments, is what led cadet Sanjana Jampana of Mt. Laurel to be asked to host the annual Girl Scout Achievement Awards on Sunday, June 5. 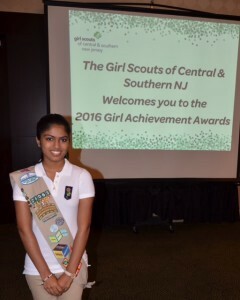 Beginning her Girl Scout career at the age of 7, Jampana, now a 16-year-old student at Lenape High School, was also selected for this honor due to her involvement in the Girl Scout Recognition Planning Committee, the council that supervises the planning and execution of award ceremonies. “I was incredibly honored, and being able to announce all of the awardees and their accomplishments was humbling and rewarding for me,” Jampana said. While hosting, Jampana discussed STEM, an acronym for Science, Technology, Engineering and Math, education. She advocated for STEM and discussed why it is her passion to someday be an engineer and why other women should consider making these fields a part of their future. “I had a great time this year as a host of the ceremony, and I can’t wait to help [the committee] plan for next year, if not to host again,” Jampana said. At this ceremony, she also received the Gold Award on the award’s 100th anniversary for co-founding a new branch of the National Science Foundation-sponsored Teen Science Cafe Network, benefiting almost 50 middle school students in her individual branch. In the past, she has also completed Bronze and Silver projects. Regardless of her recognition, she believes the hard work she dedicated to completing her project has helped her to become more selfless, caring and strong. Overall, she recalls the Girl Scouts truly guiding her in becoming more mature and be able to understand how to best communicate her beliefs and interests.